18kt. 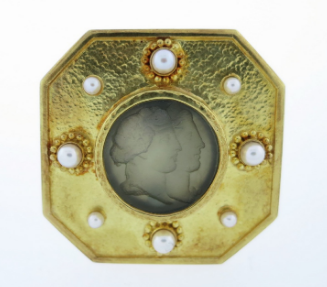 yellow gold octagonal frame pendant brooch set in the center with a Venetian glass dual portrait. 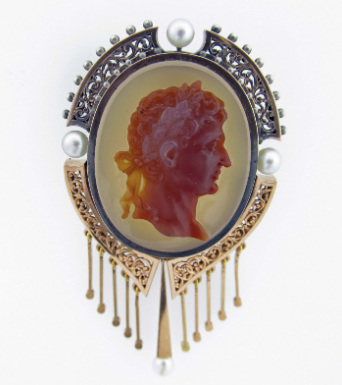 The frame is set with eight cultured pearls. Classic 14kt. yellow gold mounted shell earrings made by Maz. 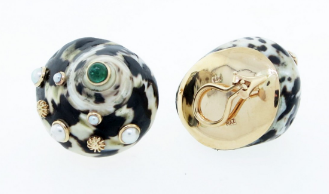 The earrings are set with a cabochon emerald center and pearl accents. Clip back posts can be added. Excellent condition! Textured 18kt. 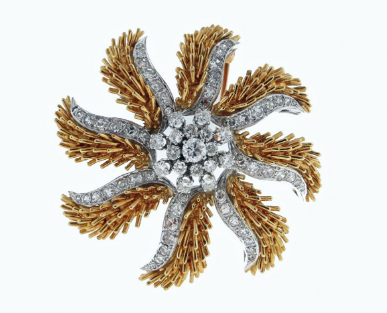 yellow gold and platinum brooch made by Henry Dunay for his exciting Cynnabar series circa 1990. 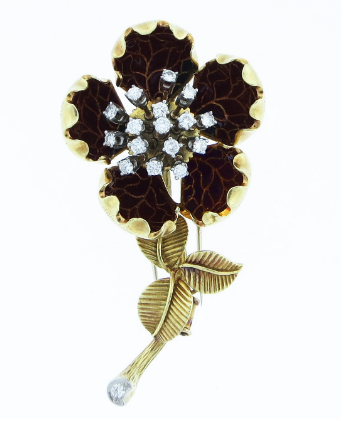 The classically inspired brooch measures approx. 2 1/2 inches in length and is set with a .25ct. round brilliant cut diamond. Signed and numbered. 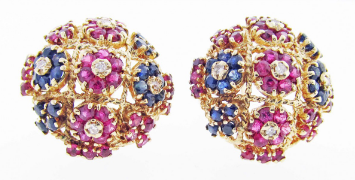 Natural Sapphires and Ruby and Diamond Flower design dome earrings in 14kt yellow gold open work mounts. 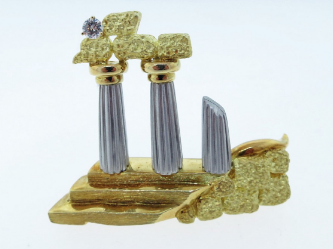 Dramatic and dimensional Art Deco design earrings beautifully constructed in 18kt. 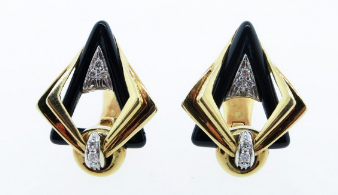 yellow gold with a center triangle of black onyx and bead set with 6 round brilliant cut diamond accents in white gold. Each earring measures approx. 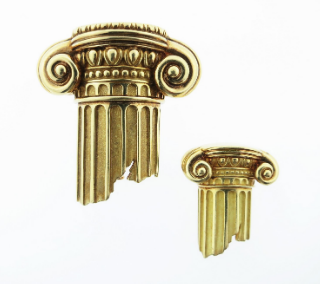 1 inch in length with clip backs, posts can be added. 18ky. yellow gold matte finish earrings made by E. Rand. 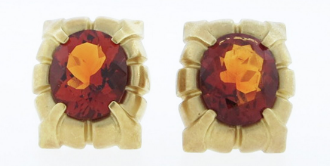 Each clip back earring is set with a faceted golden citrine weighing approx. 4.25cts. Posts can be added. 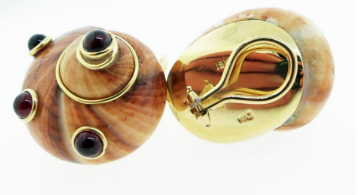 Pair of 18kt. 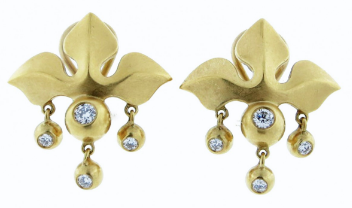 yellow gold opposing earrings each measuring approx. 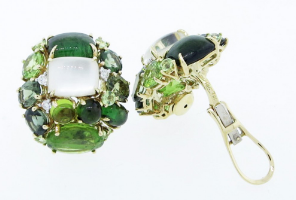 1 inch in length and are prong set with a mix of faceted and cabochon natural peridot, and tourmaline with a center moonstone accented with three round brilliant cut diamonds. Clip back posts can be added. Softly finished 18kt. yellow gold matte finish opposing design earrings made by Marlene Stowe. Each earring measures 1 1/2 " and is set with a 15.5 mm. 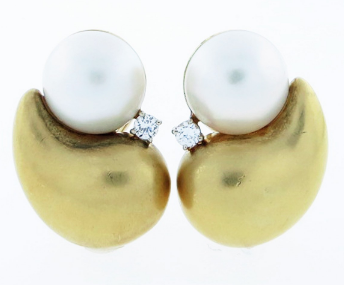 mabe' pearl and a prong set round brilliant cut diamond totaling approx. .30cts. clip back posts can be added. circa 1980 signed. 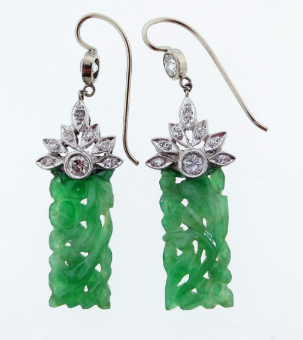 Lovely platinum and diamond topped carved jade earrings. Each dangle earring measures approx. 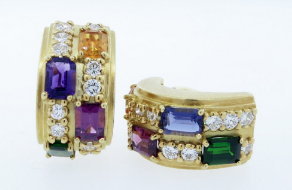 1 3/4 inches in length and is set with nine round brilliant cut diamonds totaling approx. .70cts. Circa 1950. Opposing 18kt. yellow gold wheat design earrings. 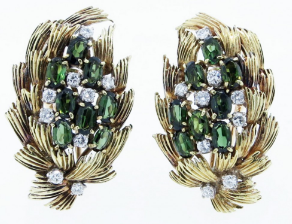 Each clip and post back earring is prong set with eight oval faceted natural green tourmalines with nine prong set round brilliant cut diamonds totaling approx. .65cts. 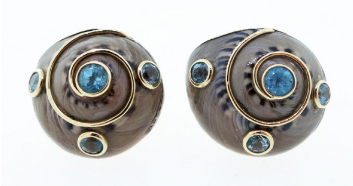 Each earring measures 1.3 inches in length. Circa 1980. 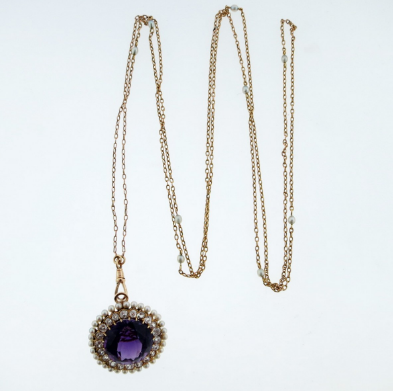 Handmade 18kt. yellow gold clip and post back half hoop earrings measuring approx. 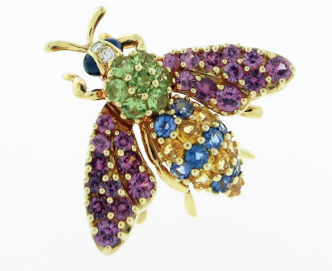 1 inch in length and is prong set with an emerald cut citrine, iolite, pink tourmaline, and green tourmaline measuring approx. 7. mm. x 5. mm. Each earring is also bead set with 11 round brilliant cut diamonds totaling approx .85cts. circa 1970. Laura Munder 18kt. Multi-Stone Earrings set with alternating cabochon cut pink quartz, amethyst, citrine, and blue topaz in a Maltese cross design clip back, posts can be added. 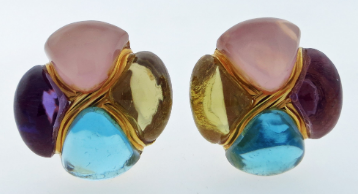 The earrings measure 1 1/4" circa 1980. 18kt. 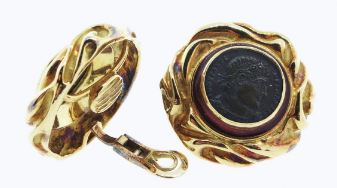 antique Constantine bronze coin earrings made by the English jeweler Elizabeth Gage circa 1994. Each earring measures approx. 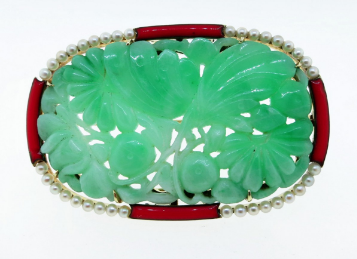 1.25 inches in diameter and is surrounded with port red enamel detail.